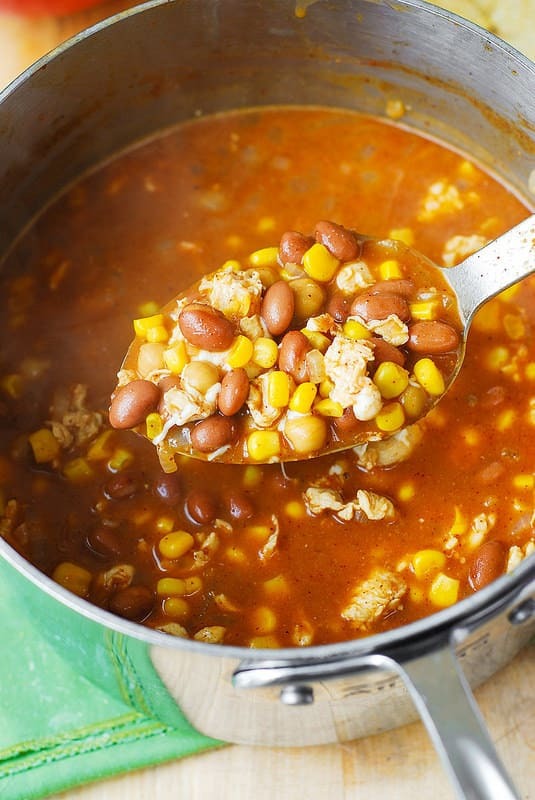 White Chicken Chili with Pinto Beans, Chickpeas, Green Chili Peppers, and Corn. Topped with Mexican (or Cheddar) shredded cheese, crushed tortilla chips, and sour cream. Easy and delicious! Gluten free recipe, made completely from scratch. 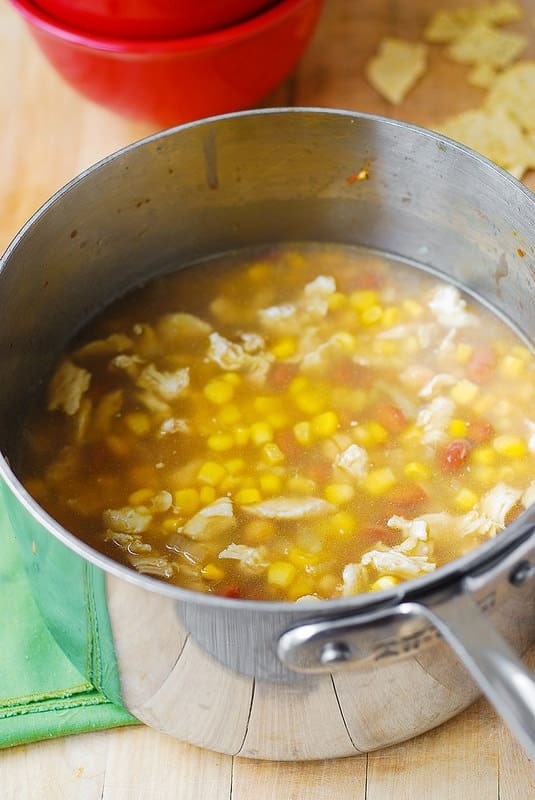 This is one of the best white chicken chili recipes I’ve ever tried! If you love white beans in your diet – make this chili! Garbanzo beans, pinto beans fit perfectly in this dish. You’ll love garlic and cumin flavors! 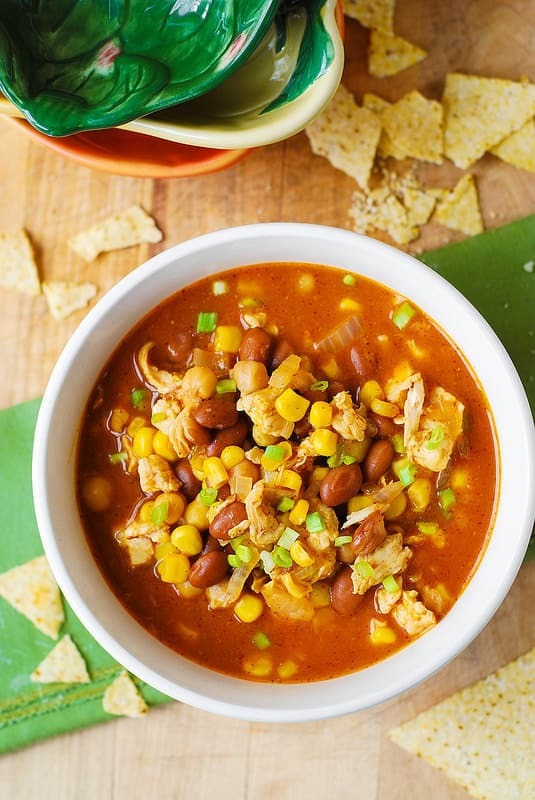 I actually prefer this easy white chicken chili to any regular beef chili: the flavors are so rich, the chili is very filling, yet light (not heavy). Love these kinds of food! Makes a great lunch at work, too! Use one pan for cooking everything. Cook the chicken right in the large sauce pan where you will be cooking white chili. If you don’t have a can of refried beans, use an extra can (15 oz) of pinto beans (or any white bean), pureed. The idea of adding refried beans or pureed beans is to thicken the chili. 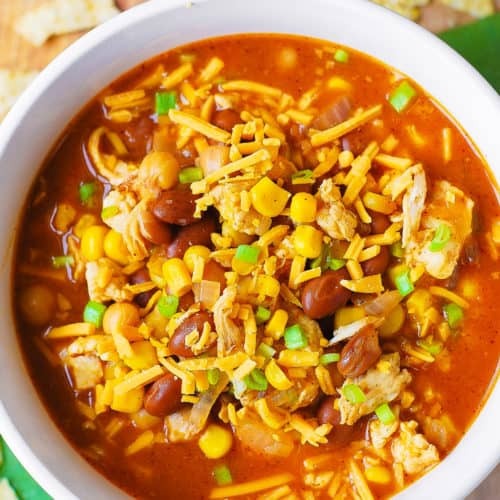 When the white chicken chili is ready to be served, garnish with shredded Cheddar or Mexican cheese, sour creams, and chopped green onion. And, here are a few step-by-step photos. First, cook sliced chicken seasoned with salt, chopped onion, minced garlic, 1/2 teaspoon cumin in a large sauce pan on medium heat for about 5 minutes, constantly stirring, until onion is soft and meat is no longer pink. Slice the cooked chicken so that it looks like it’s shredded. Also add corn, refried pinto beans + plus spices. 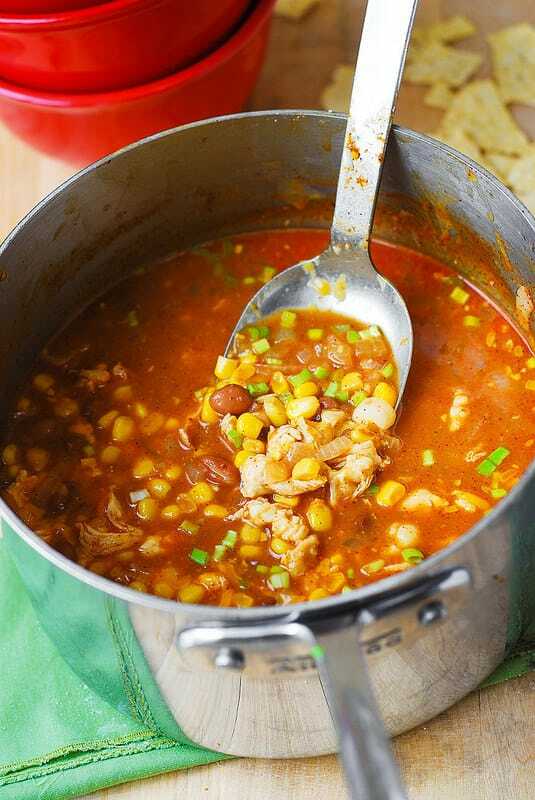 White Chicken Chili with Pinto Beans, Chickpeas, Green Chili Peppers, and Corn. Garnished with Mexican (or Cheddar) shredded cheese, crushed tortilla chips, and sour cream. Gluten free recipe. Heat the oil in a large soup pot over medium heat. Add the sliced chicken breasts, chopped onion, minced garlic, 1/2 teaspoon cumin and salt to taste, and saute on medium heat for about 5 minutes, constantly stirring, until onion is soft and meat is no longer pink. 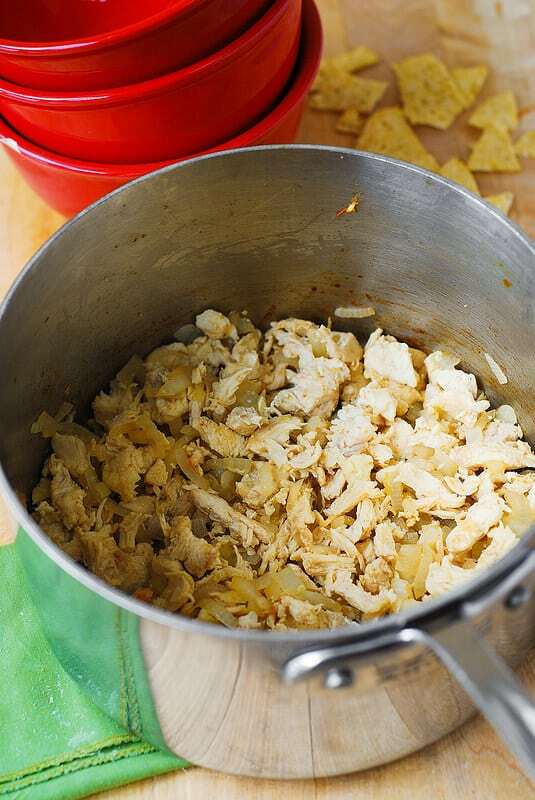 Cut up the cooked chicken into even thinner slices so that it looks like it's shredded. 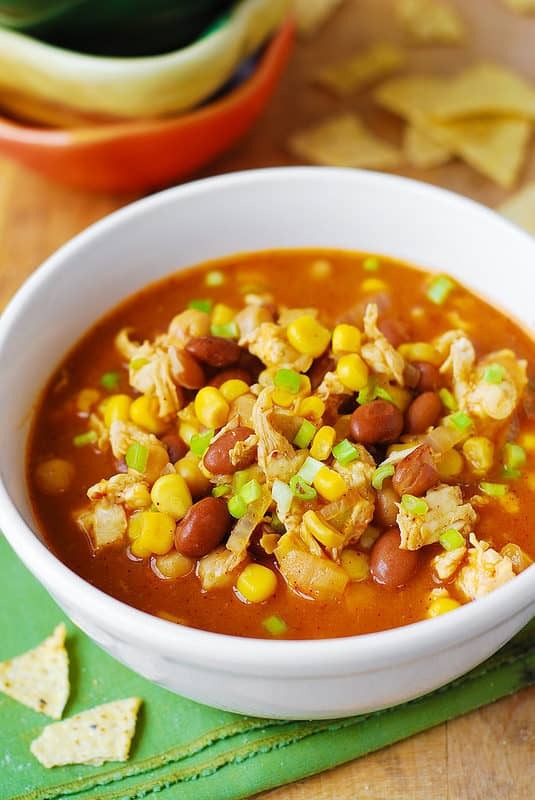 Add chicken broth, green chili peppers, remaining cumin (1/2 teaspoon), 1 tablespoon chili powder, pinto beans, garbanzo beans, corn, and refried pinto beans. Stir everything well, making sure refried pinto beans are evenly incorporated in the chili, making it thick. 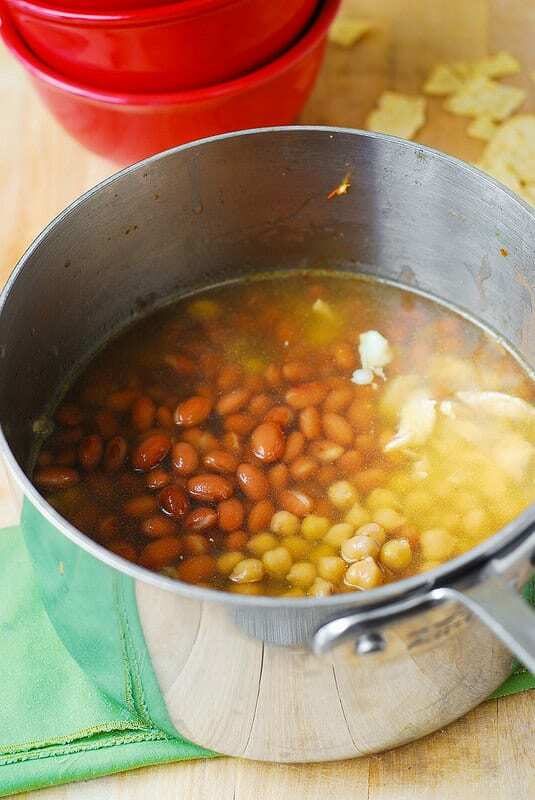 If you don't have a can of refried beans, use an extra 1 can (15 oz) of pinto beans (or any white bean), pureed. The idea of adding refried beans or pureed beans is to thicken the chili. Add more chili powder if needed. Bring to boil, make sure to stir all ingredients well together to combine flavors and spices. Reduce to simmer and cook for 15 minutes on simmer, constantly stirring, until the chili thickens. 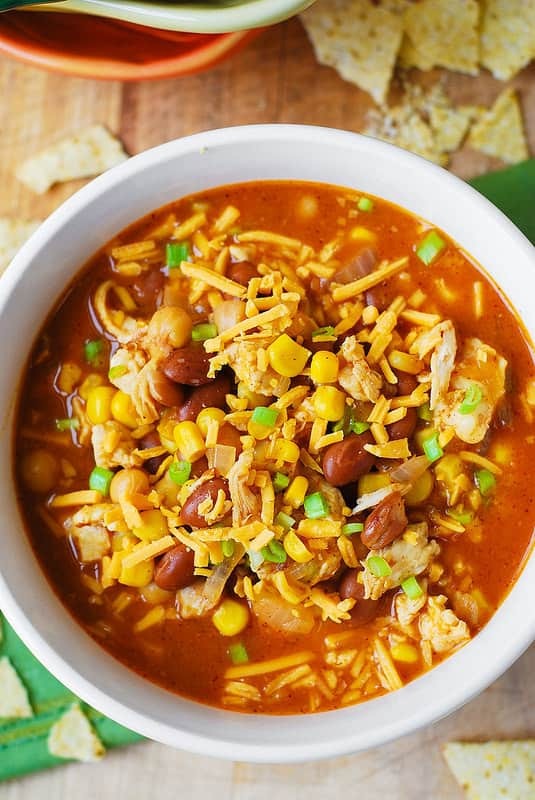 Serve in soup bowls, garnished with shredded Cheddar or Mexican cheese, sour creams, and chopped green onion. I just made it and it came out delicious! I added different spice from my pantry and wow I’m blown away! Thank you for this recipe! I made this, and the color was no where near the same. It was more of a dull grey. Not very good flavor, but was able to make a few additions to the point where we ate it. Hate leaving bad reviews, but wanted people to know. Do you think i could substitute the pinto beans and re-fried pinto beans with black beans/re-fried black beans? My girls love black beans! Yum! I am so hungry for homemade chili right now. My favorite chili is not the heavy kind that weighs you down. Love this recipe and cannot wait to try! Thanks for sharing, my friend. Definitely pinning! 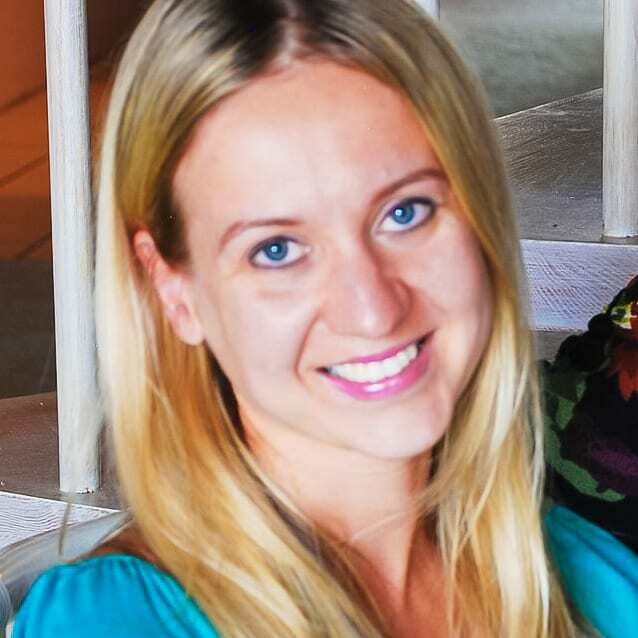 I love the idea of chickpeas in this chili…it sure sounds and looks delicious Julia…thank you so much for the inspiration. Love the different beans you have in here! Looks fantastic!